On our recent trip to Texas, we spent time with Grammie and the Stires. Grammie's signature is her "Surprise Suitcase", which she fills with prizes for good behavior, kind gestures and obedience. The kids LOVE reaching their hand in to grab a goody. 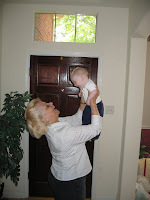 Mason couldn't reach in to get a prize (although he was very obedient), so Grammie showered him with kisses and love. That's the best gift of all! What marvelous memories we have made! 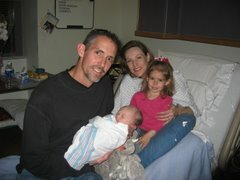 How fast the little ones grow so we take every precious moment to appreciate it all. 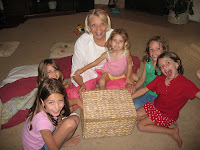 I have so enjoyed the novel idea of the "Surprise Suitcase"...where the idea came from (my heart, I do believe)I really cannot say, but it works and everyone enjoys the thrill of the "surprise". 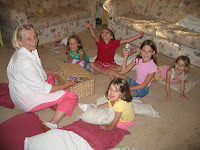 As the children's Grammie, I thank God for blessing me with life and laughter! 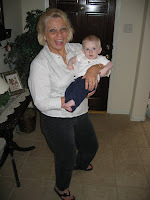 Perhaps what it all boils down to is that Grammie is just a big kid and enjoys "playing" with the little kids!